It's nearly 12am now, I am squeezing a bit of my sleeping time to update my recent activities. With the help of my better half, my Kids Fashion Dot Com business has finally opened its door for business last Saturday, 19/1/2013. I suddenly felt good about pushing the front shutter up that day after days of closed door preparation though I still have not got enough stocks to fill up my shop. 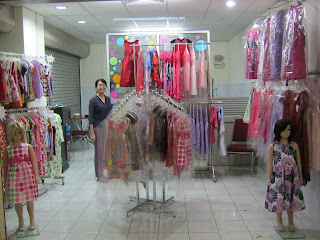 It is a small display area occupying only the front portion of a corner shoplot in Central Shopping Plaza, Kepayan, Kota Kinabalu, Sabah, we use the back portion as office. It is one of the least crowded shopping centre in the city, most people will question why we chose this place to start a business. For reason being that it is near to my kids' school and the rental is reasonable. We had some sales over the weekend and hope business will catch up with more people know our existence. That's where I will be spending my time during weekends and public holidays managing my new business by offering beautiful and affordable children's garments to my customers. We hope to expand into more outlets in the coming months..wish me luck!! I may be in KK in May for a short holiday. Hope to swing by your shop if time allows. By the way, do you sell boys' clothing too? Yes, there are boys' clothing as well but for smaller boys at the moment..will consider getting bigger boys one, have to see what's the demand like..
Agnes, I love browsing at your Kids Fashion album when you shared it at FB. My elder 9 years old may have out grown most of your kid fashion. My 7 years old probably still can wear some. I wish you all the best in your new business. I would say your kids fashion is very very nice. I am serious. Sounds interesting! Must go browse browse later, hehe. But looking at your photo, all are girls clothing, got anything for boys? I do have some for the boys but mostly for girls, will strike a balance in time to come. Will upload to my FB or kidsfashiondotcom@blogspot.com soon.